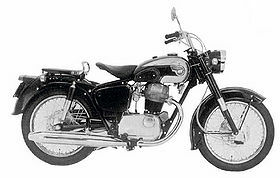 The Kawasaki SG was a street motorcycle manufactured by Kawasaki and based on earlier Meguro Works designs. It was sold from 1964 through 1969 and featured a 250cc 4-stroke engine that produced 18 hp @ 7,000 rpm. Early versions arriving in America came with a either a Meguro or a Kawasaki bade on the tank. The SG was available in both solo and long touring seat styling. Remarks: Four-stroke, single cylinder street model with double cradle frame. Has steering friction damper, unique style seat, and electric starter. This page was last edited on 26 November 2010, at 21:22.